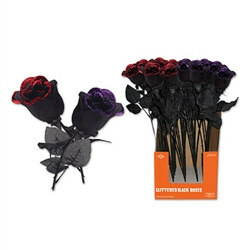 Start setting the mood for Halloween around your home with the Glittered Black Rose (1/pkg). This Glittered Black Rose can be used in your table decorations, set up in a haunted vase. With this Halloween accessory, your holiday decor will be better than ever with such a simple piece that makes a big impact on your theme. Even better, send out invitations with a black rose attached as a party favor that everyone will be intrigued to receive and want to know more about the occasion! It looks good but I must have missed where it said it was a single rose. Will have to order a couple more.